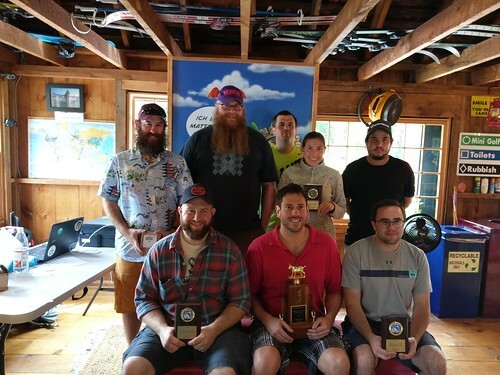 The second running of the Matterhorn International Pro-Am was held on September 22, 2018 at Matterhorn Mini Golf in Canton, CT. This year saw 13 players enter the five round pro division and an additional 18 play in the three round amateur division, with a third of the pro field being made up of USPMGA players. It was a beautiful day with partly cloudy skies and a nice cool temperature � a quintessential New England fall day and perfect for putting. The course provides a variety of different putting challenges with a score of sub-40 considered good on most days. This day the course would not give out many of those scores as the pros would find out. In the first two rounds, the only sub-40 scores were shot by Anna Wallace who held the lead after two rounds but slipped to second with a 43 in the third round. Justin Seymour would take over the top spot by two strokes after hitting his first sub-40 round of the tournament, carding a 118 for the morning session. Behind these top two was a logjam as third through tenth were only separated by three strokes, a testament to how difficult it is to pick up aces on the course to pull away from the pack. With the morning out of the way and lunch in everyone�s stomachs, the pros took to the course for the 4th round, and similar to last year we saw the scores start to drop. Round 4 (average of 41.3) and round 5 (average of 41.1) would have the lowest average scores for the pro field, showing that the competition stepped up as players looked to make the money. The charge was lead by Danny Olejnik who shot three aces and carded a 37 in the fourth round (tied the tournament record) and then a 38 in the final round to seal a second place finish. Steven Langlois, the amateur winner from 2017, would make a similar move carding two 39s to finish in third place. Pat Sheridan would also shoot a 39 in round 4, with a 40 in round 5, to secure fourth place for the second year in a row. The average of the top eight paying places over the final two rounds was only 40.1, showing how close everyone played. At the end of the fourth round, the backup was even greater than after round 3, with only three strokes separating second from tenth place, meaning anyone could move around over the last 18 holes. The only constant was Seymour, who had a four stroke lead going into the final round and with two aces on the front nine, carded a 39 and kept his hold on first place, winning $500 and the coveted �goat� trophy. It was excitement in the rest of the pack. 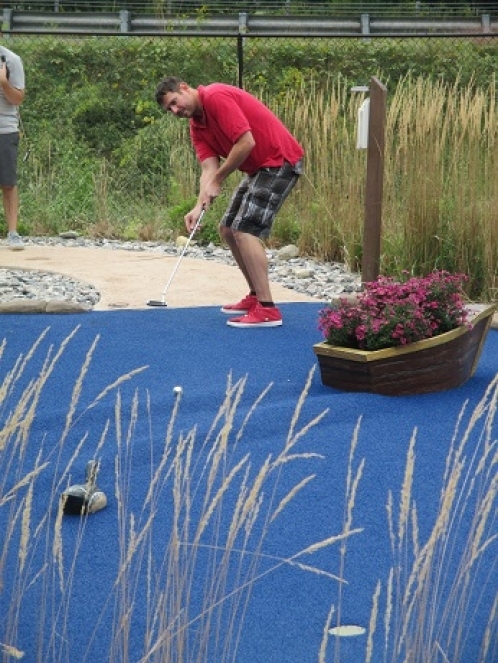 Olejnik and Langlois were tied for second heading into the final round and Olejnik�s solid 38 just squeaked out the second place spot by one stroke. His ace on 17 to Langlois� three swung the score in his favor headed into the last hole. Sheridan, who held a one-shot lead over five people behind him, carded the 40 to keep fourth place by one stroke over Wallace and recent Maine Open winner Randy Rice, who tied for 5th. 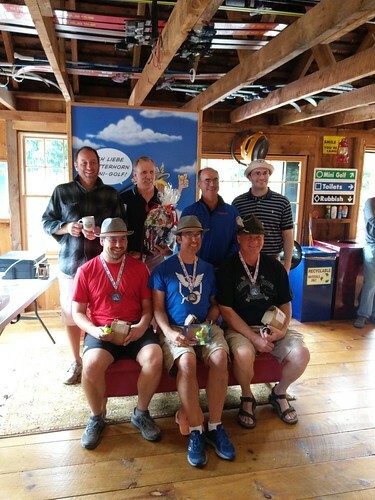 There was a three-way tie for the last two playing places between Brian Coscina, 2017 champion Mark �The Highlighter� Novicki and Robert Boisvert. This lead to a playoff on the 15th hole where Coscina and Novicki aced the hole to Boisvert�s deuce, leaving him the odd man out. Wallace would close out the awards with a tournament record ten aces over the five rounds to win the hole-in-one plaque. On the amateur side, things were just as close at the top of the leaderboard. After three rounds and some scores that would have given the pros a run for their money, Dan Hurley and David Hudon were tied at the top with a 125. This forced a playoff from hole one which went to hole three until an unfavorable bounce left Hudon with a long second shot, which just missed the hole and Dan carded the deuce. Andrew Thurston came in third, one stroke behind the leaders and Rand Cooper rounded out the top four one stroke behind Thurston. The amateur winners all walked away with various prize packs. Final scores pro division and amateur division. To add comments, you need to log in.